Something is wrong with the website today and it keeps freezing due to which my browsers also are crashing. Tried using it in chrome and internet explorer but both the times the page kept freezing. I've got this from them. I don't know, something is wrong with their website. Hopefully they will fix it soon. I'm starting to lose my trust. This kind of things should not happen. Ok, site seems to be working normal now. Please don't do this again. I noticed that people are having problems accessing this exchange recently and it appears that the representative of it here in the forum isn't responding at all (or on a timely basis). I visited the website few seconds ago and it is working on my end but my point is that they should, at least, inform the forum users here if there will be any technical issue on their site to avoid any panic-induced comments in this thread. People are almost always on the edge right now because of the recent problems that we had in different cryptoexchange (BTC-e, ehem). EDIT: Okay, I just saw the screenshot provided above and they are indeed informing their customers thru email. But it wouldn't hurt if they could do that also here in their thread. this site are working normal now. i hope this site dont have problem like this in the future. so every one can enjoy trading and build positif trust with this site. I sent some XEMs to this exchange 23 days ago, and to date nothing has been credited. I write to their support center DAILY, but the situation does not improve; 90% of the time my tokens are deleted or ignored. What the hell is going on ?? !! 25 days passed and no XEMs credited. They are adding one coin a day but, clearly, they are unable to handle the overburdening. Is there any KYC that you need to do in order to withdraw btc from this exchange? People are facing a lot of problems with the website maybe they are working in the background. Now I am accessing the Hitbtc website as normal maybe we have to clear cookies sometimes. 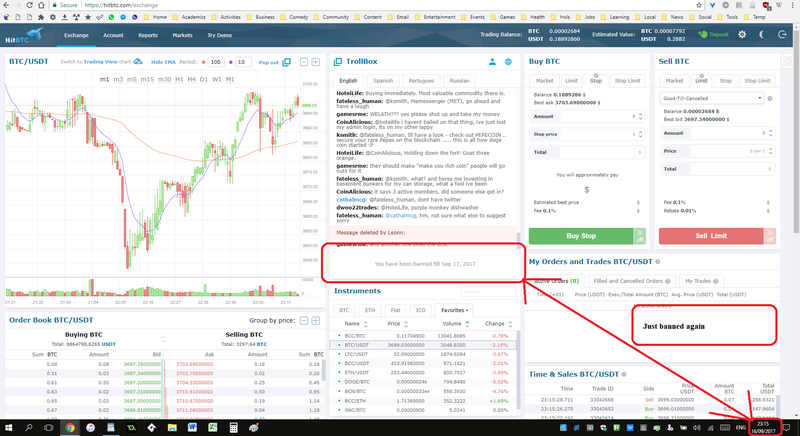 HitBTC, can you add Burst in your exchange? It would be a good addition for a growing exchange like yours. Burst is the only coin out there that can be mined using your hard drives and for that it makes it very unique. They also now have a new group of developers that call themselves the Proof of Capacity Consortium. They will be responsible in coding new wallets and an easy to use software for mining. New implementations using other programming languages other than Java is also coming. 29 days ago I opened a ticket on HitBTC support (Ticket ID: 21012), after about 7 days an automated message appeared on the ticket and closed it soon after (presumably also automatically). When I try to bring this up on trollbox I get my messages deleted by the moderator and get banned for one hour, even though I am only asking when my ticket will be resolved, HitBTC seems to remove any negative opinion on their site and even seem to have employed someone to patrol their trollbox also. This kind of censorship should be very worrying for any users of the site. The error I have submitted the support ticket about is shown in this video (https://sendvid.com/mzdrjwh5). Basically the error involves their software failing to execute stop and stop limit orders due to a bug. When you autocalculate the order amount the wrong amount of coin is submitted leading to a failed order every time. I'd suspect many other users have come across this and it will have similarly have led to losses. In my case I've lost not a massive amount of cash but its still worrying there is no response from HitBTC. Just seems like they do not care for their customers at all. I wonder if I will ever get this resolved. Usually I wouldn't bump a thread but in this case I think I am obliged as I have not received a single response from HitBTC in the 37 days from the date my initial issue was raised. What gives HitBTC? Do you just not care about your users? What purpose does BTU (now BUS) "Bitcoin Unlimited Support" serve? I thought these would credit to the fork in case of any hard fork. They did not. Will they still become REAL Bitcoin Unlimited in the case of another hard fork? OR are they a useless token, as this article makes them sound? In which case, I feel I've been scammed? What purpose does "Bitcoin Unlimited" support coin actually serve? "Should the hard fork occur, HitBTC would operate as described here, without changes. Your account won’t be credited with BTU." So these are now a useless token, or is it actually pegged to any existence of a bitcoin unlimited thread? I've noticed a strange thing with fees that HitBTC charges if you want to buy coins for super low price. Just try to place an order for example TNT/BTC. Total is 0.1 and Fee is 0.1, that makes commission 100%. How do altcoin developers have their coin listed in HitBTC? Is there an application and selection process or something like that? Does the exchange listen to the community and let them have a vote on what coin is listed next? I heard that some exchanges require payment to have a coin listed. Is this also the same with HitBTC?